Nearly every time you’re working on your bike, there are three types of tools that you’ll need: Wrenches, screwdrivers and pliers. Let’s start with wrenches, or spanners as they’re usually called in Britain. 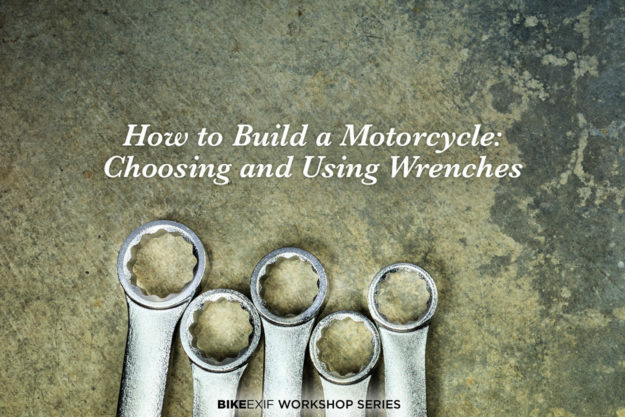 Since your motorcycle is mostly bolted together, you’ll need different types of wrenches to take it apart. So I’m going to focus on the wrenches that give you the most ability at the lowest cost. The Ring-and-Open-End Wrench This is probably the most used tool in my kit. Let’s look at it in more detail. The flat jaws of the open end make contact with only two corners of the nut. The head is offset by a small amount. This allows you to use the open end in a restricted space where the ring end won’t fit, turn the nut a small amount, then flip the wrench over, put it back on the nut and turn it a small amount, and so on. Well, yes, but if you can’t fit the socket into the space where the nut is located, you still need an open end wrench. My suggestion is ring-and-open-end wrenches should be first priority. After you have the basic screwdrivers and pliers, then worry about socket wrenches. You can see the physical size difference. 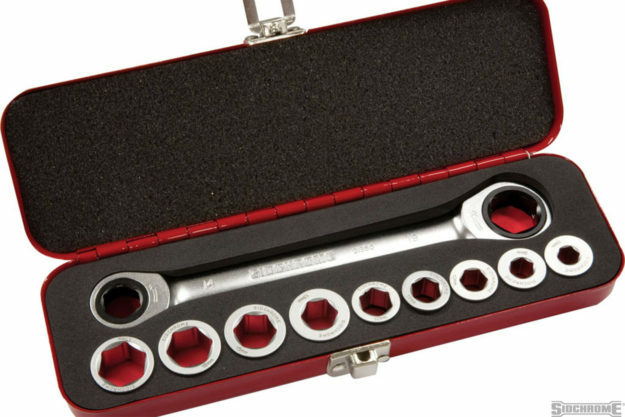 For motorcycles, I would recommend purchasing a socket wrench kit with 3/8” drive. I find this to be most useful. The 12mm socket (shown fitted to each handle) is the biggest socket I have for my 1/4” socket handle, and one of the smallest on my 1/2” socket handle. Sometimes the 1/2” drive sockets are too large to fit around the restricted spaces on motorcycles. They are great for working on cars, but too large for motorcycles. If you want to purchase a socket wrench kit, have a look for a 3/8” drive set that has both metric and imperial sockets. 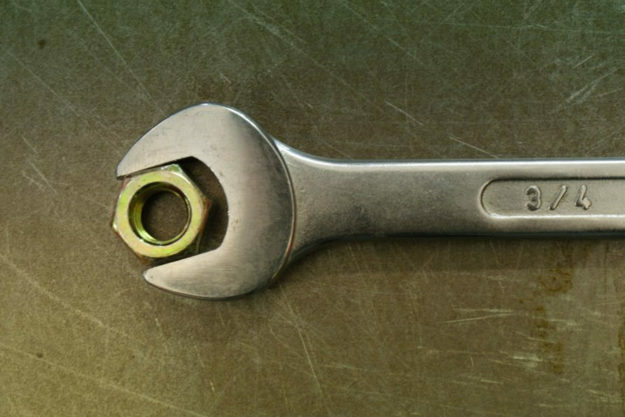 Ratcheting ring end wrenches A relatively recent innovation, this type of wrench (below) blends the size benefits of the ring wrench with the speed advantages of a ratchet handle. The size of the ring end increases slightly to accommodate the ratcheting mechanism, but the speed of installing or removing fasteners is greatly enhanced. Flank-drive wrenches and sockets Flank-drive technology is worth a mention, and this design has gotten me out of trouble more than once. Flank-drive refers to a socket or wrench design that drives off the side (or flats) of a bolt or nut, not off the corners as done traditionally. A few manufacturers produce a flank drive, such as Snap-on and Draper. The commonly available product in hardware stores in Australia is by Metrinch. 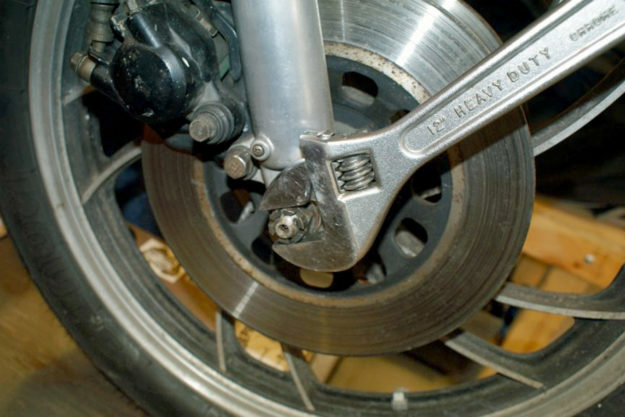 For those of us working on older motorcycles, which have usually been taken apart sveral times, you’ll occasionally find a bolt or nut that is ‘rounded off.’ This can occur when the socket or wrench selected is slightly large—such as using a ¾” wrench on a 19mm bolt head, or using a loose adjustable wrench. As the fit is loose, there is a very high stress on the corners of the bolt head. 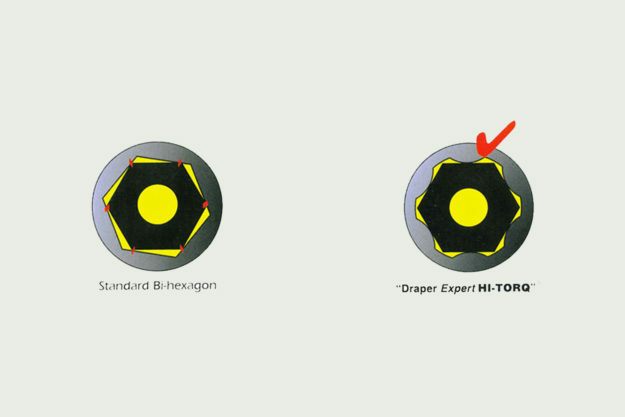 If the bolt is very tight, corroded or jammed, the corners of the bolt head can yield and essentially get ‘wiped off.’ Now we don’t have any corners for a traditional wrench or socket to drive against. And when you put a wrench on the rounded bolt and pull hard, you just make the rounded head worse. Flank-drive wrenches give you a way out, as they don’t drive off the bolt head corners. It is possible to remove a well-rounded bolt with this technology. I’ve purchased a set of these sockets in ½” drive impact version—so I can use them with both a ratchet handle and an impact driver. 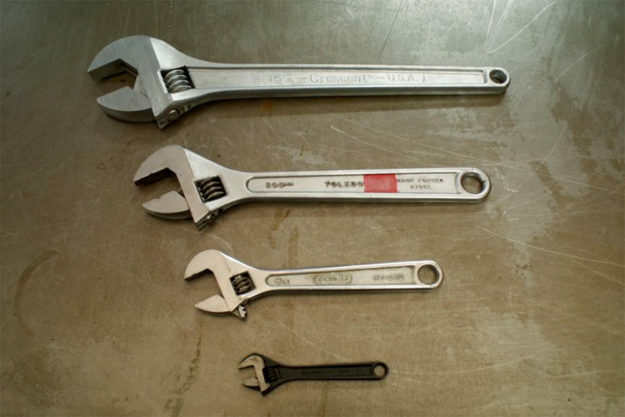 Adjustable wrenches An adjustable wrench is not a tool I would recommend for maintenance, but it has one specific use when you are building your tool kit. Generally speaking, ring and open end wrenches, and socket wrenches in 3/8” drive, will not be large enough for axle nuts on a motorcycle. 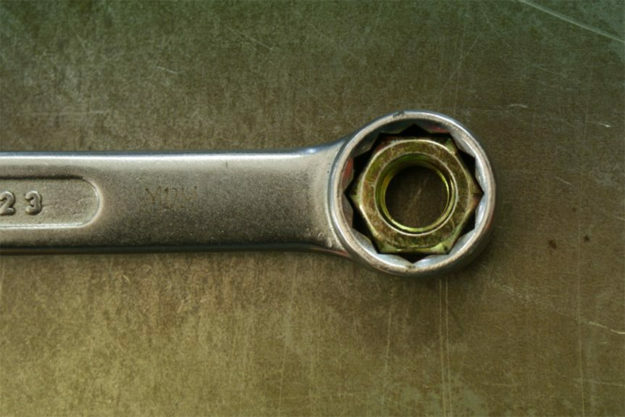 Adjustable wrenches have to be used carefully to avoid damaging the nuts. The jaws must be done up as tight as possible on the nut to prevent the wrench from slipping and ’rounding’ over the corners of the nut. Taking care of wrenches Wrenches are made of metal. Both wrenches and sockets are usually chrome-plated to prevent rust, but screwdrivers and pliers may not have this protection. In addition, you’ll have that sense of satisfaction that you ‘did it yourself,’ learnt something about your motorcycle, and are on the journey to your own custom ride! 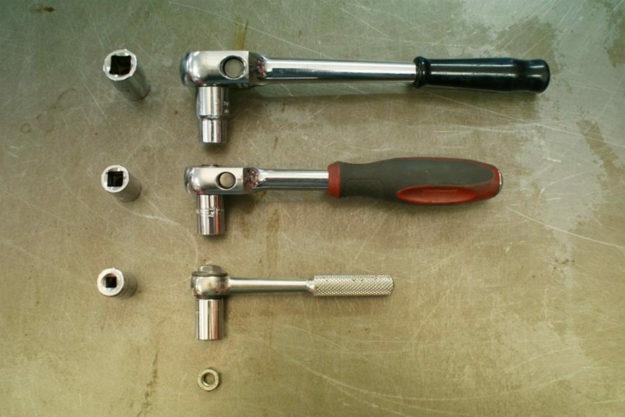 Need even more information on wrenches and their use? Learn about Price vs Quality, and download a free and super-detailed PDF here.